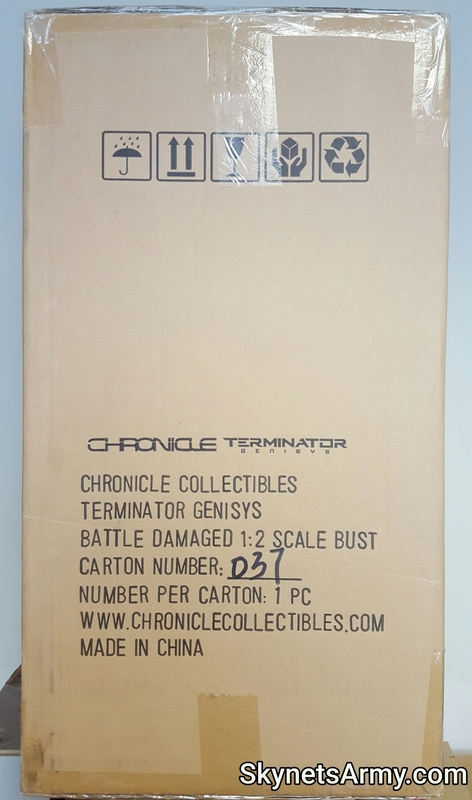 Lets first take a look at the shipping box. 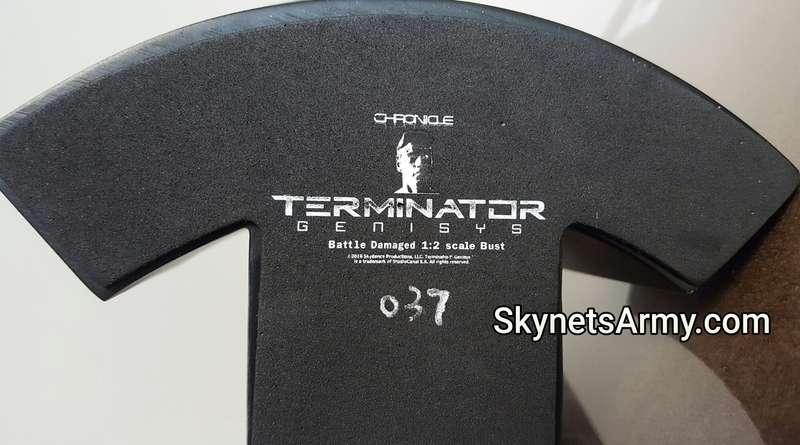 You can see the box not only details the product inside but the limited edition numbering of your collectible as well. The piece we’re looking at is #37 of 500. Let’s open the top of the box. 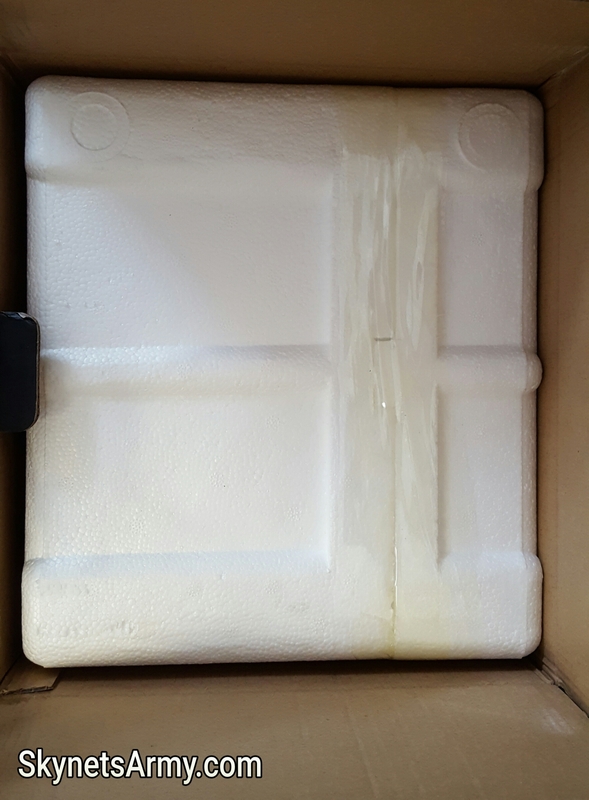 Now lets pull out these four soft foam dividers from the corners and pull the interior box out. 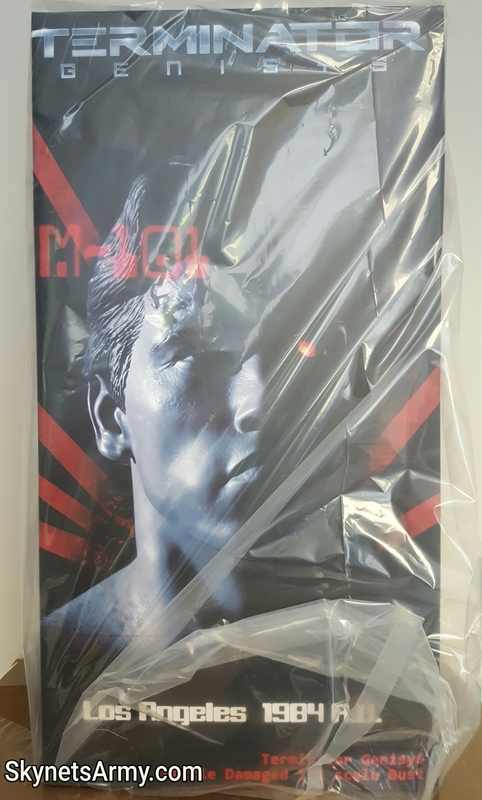 Now let’s remove the clear protective bag and take a better look at this packaging! 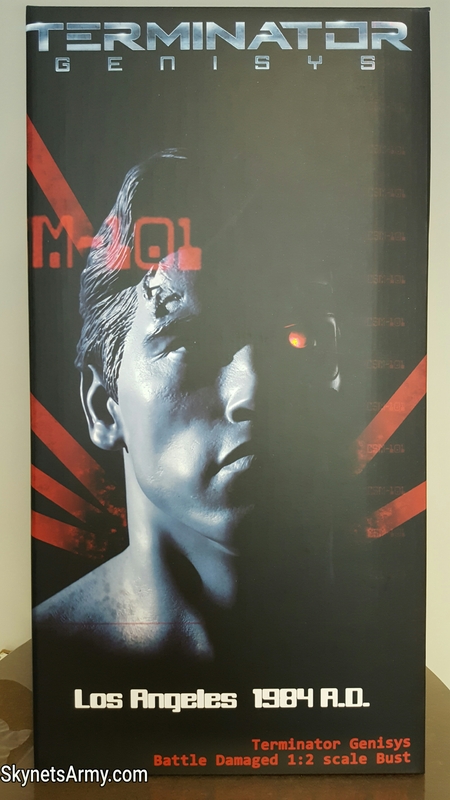 Check out that box art! It certainly captures the vibe of the original film, doesn’t it? 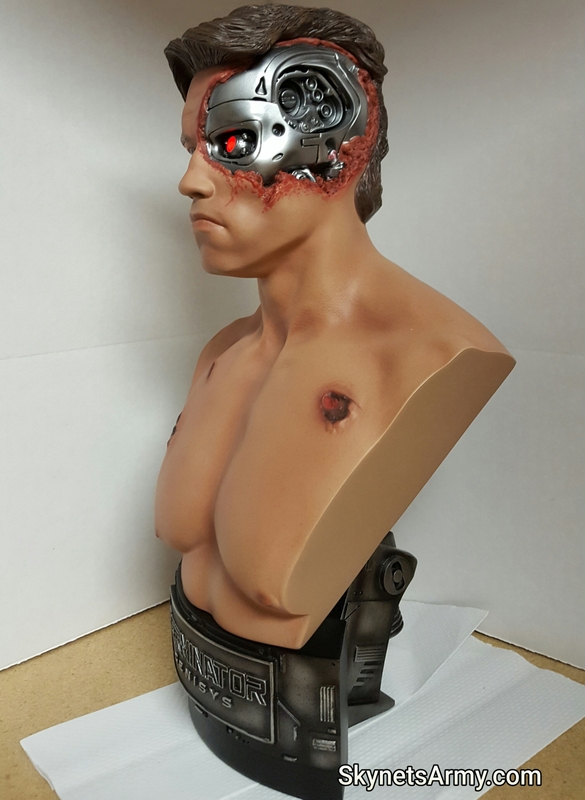 Yes, this design is definitely inspired by the movie that started it all, 1984’s “The Terminator”! Now since there is no art on either side of this box, let’s just have a look at the back. 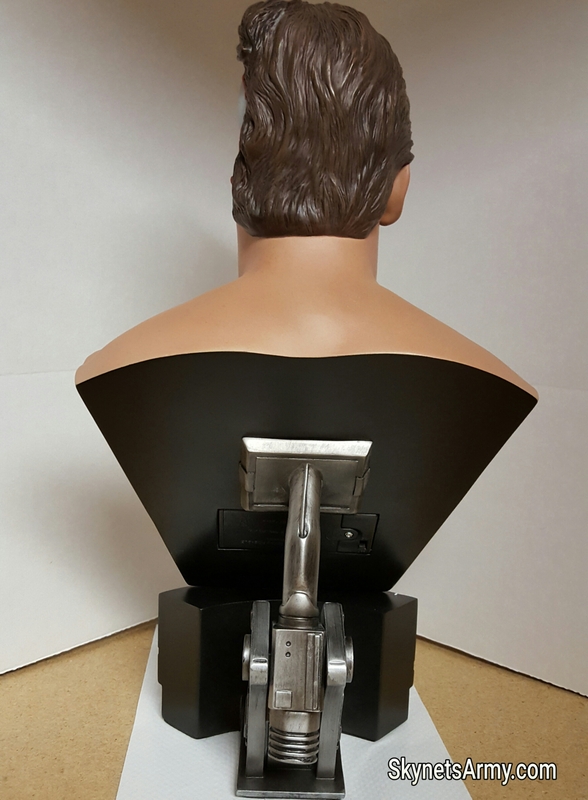 The back features a professional picture of the bust inside. Let’s open the top. 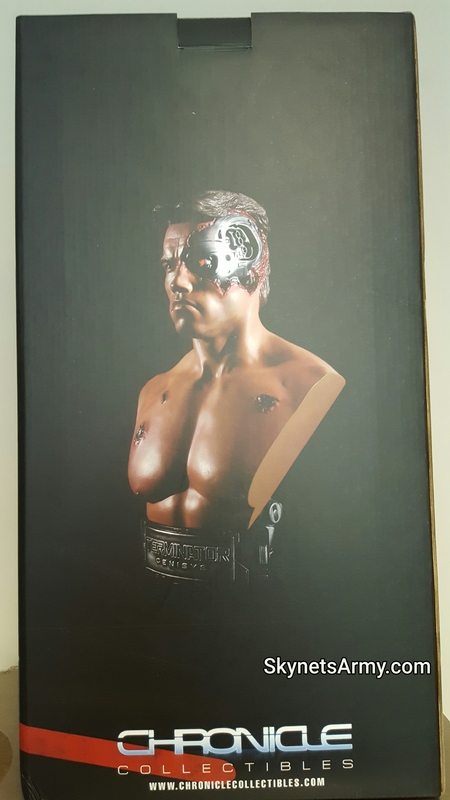 Good, the bust is protected in a styrofoam shell. We’ll pull this out. 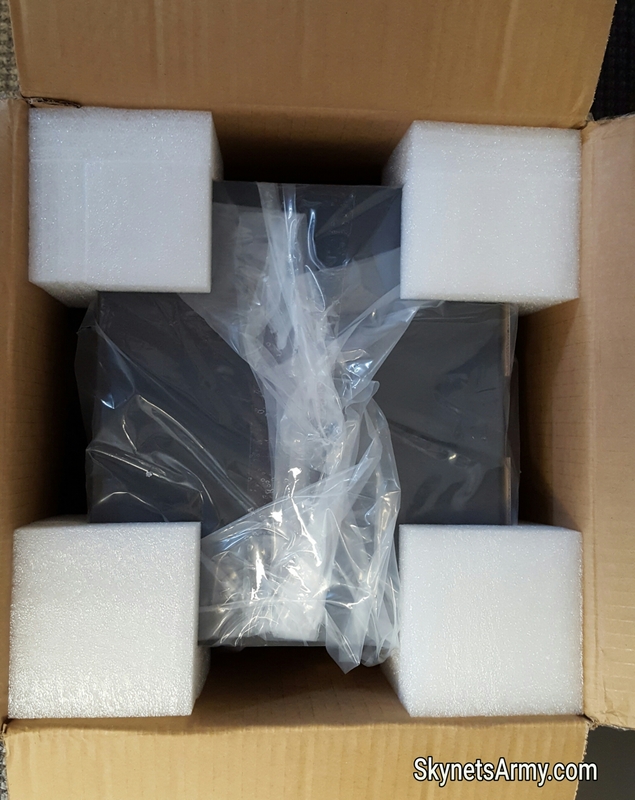 Now let’s have a look at what’s inside, shall we? 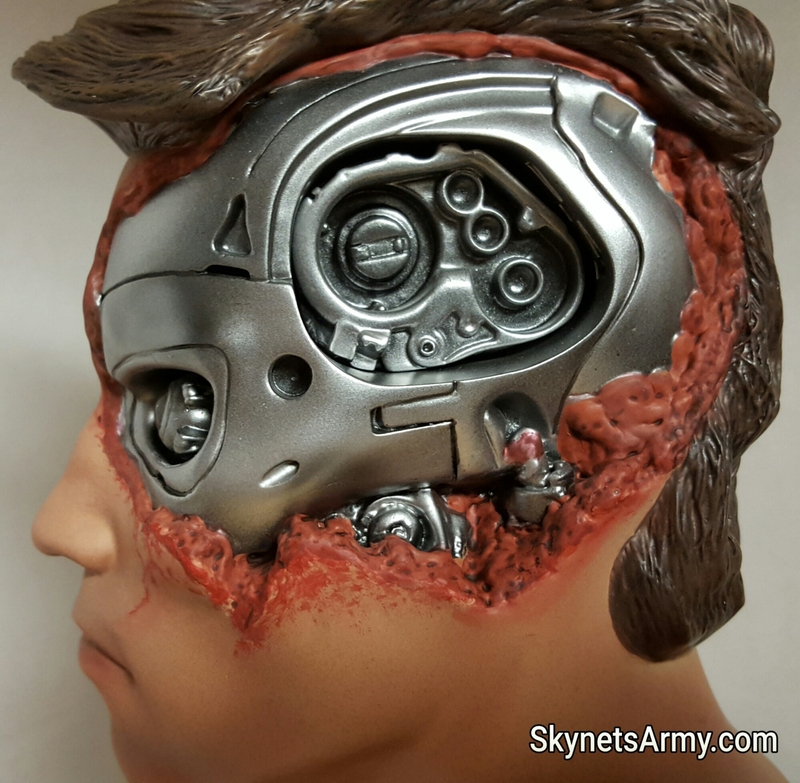 The bust comes in two pieces, protected in separate foam compartments. 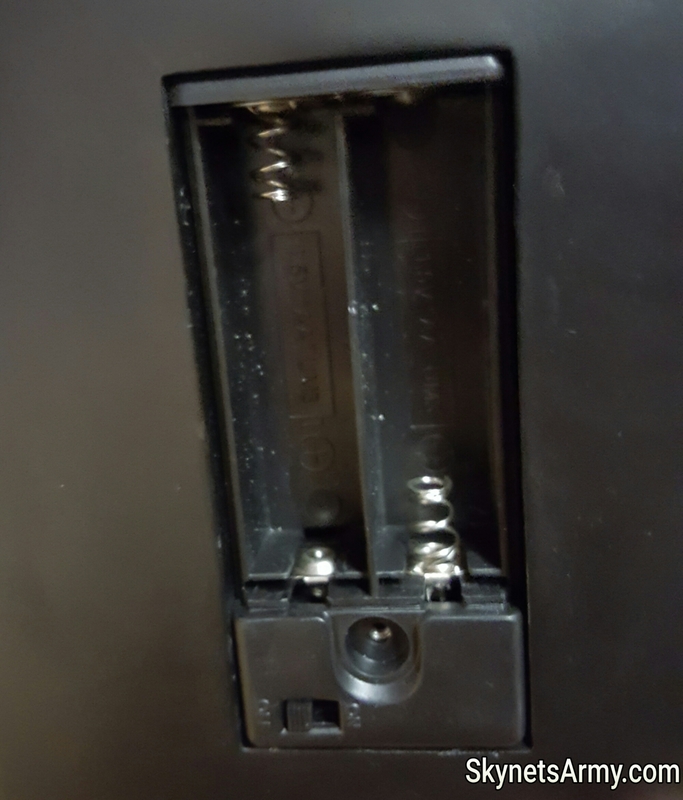 There is a bag with an extra screw for the battery door too, just in case you ever lose its original screw when replacing the batteries (more on that later.) We’ll first pull out the base. 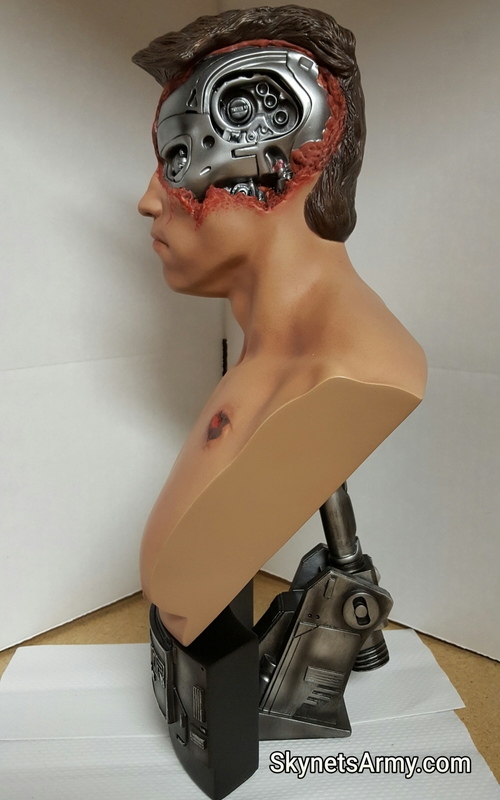 Now that the base is out, it is time to assemble the bust! Wow! Simply glorious! The bust slides into the base easily and securely. 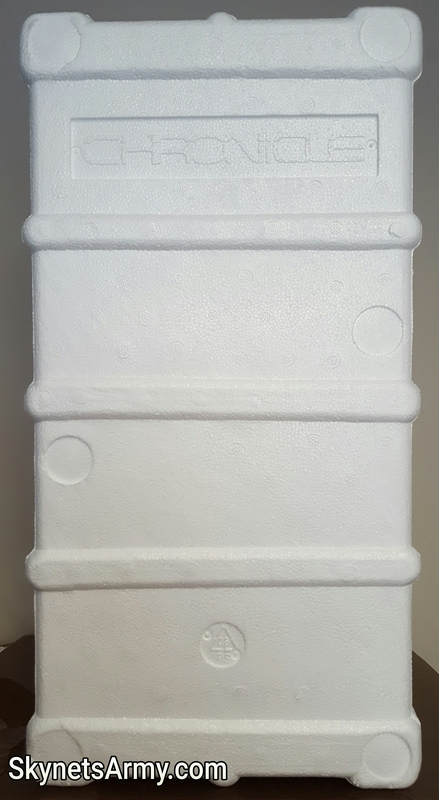 The dimensions of this beauty is 14″ tall, 8″ deep and 6″ wide (inches). 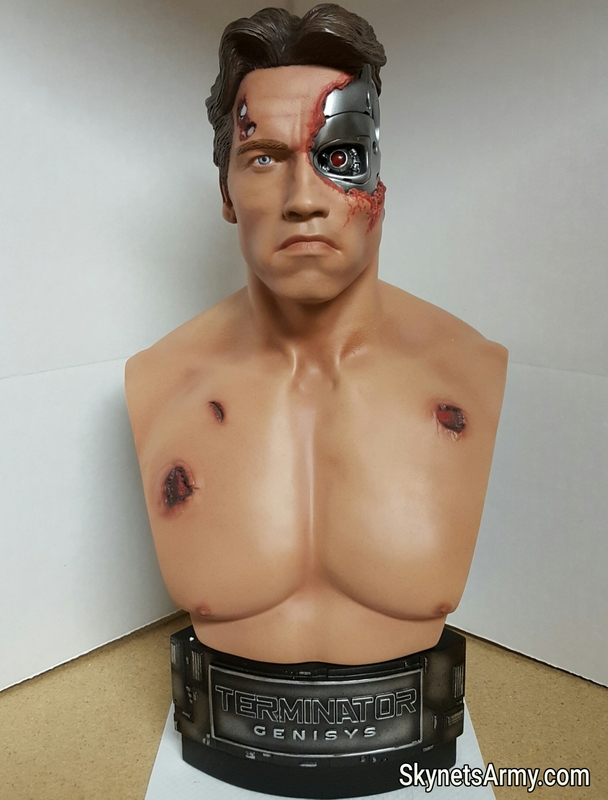 Let’s rotate this bust, and while we do, check out all the great battle damage on his face and body too! 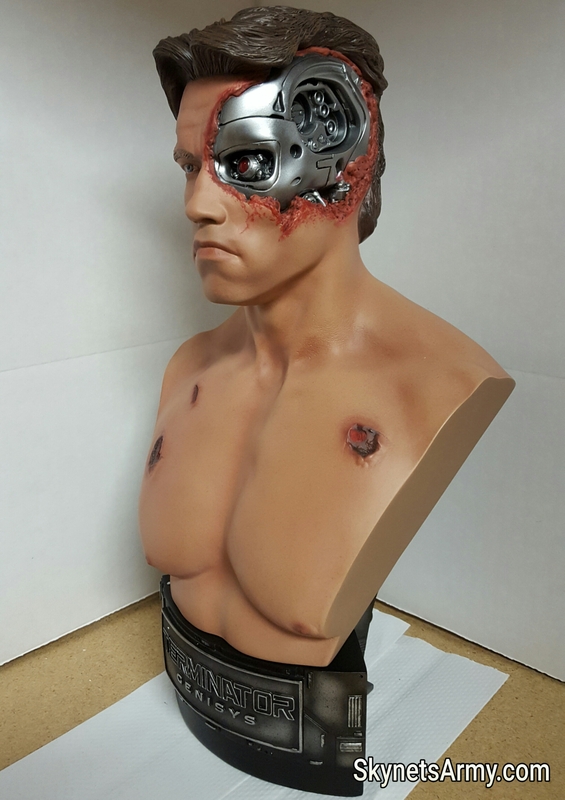 And now we’re back to the front of the bust! Wow! 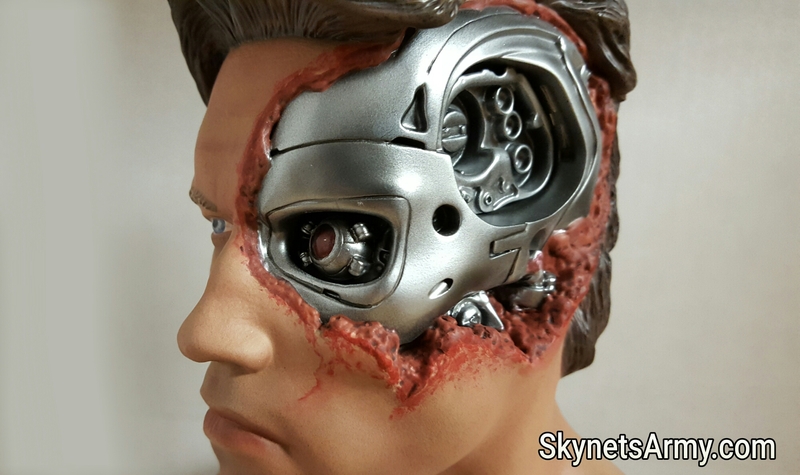 What a wonderfully grotesque depiction of torn cybernetic organism flesh! 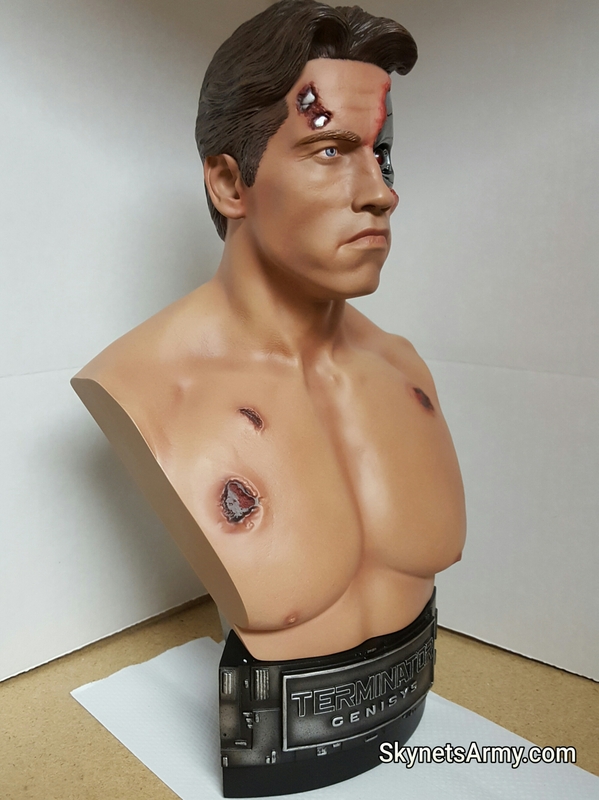 The battle damage is so well done and truly looks fantastic! But wait, there’s more! 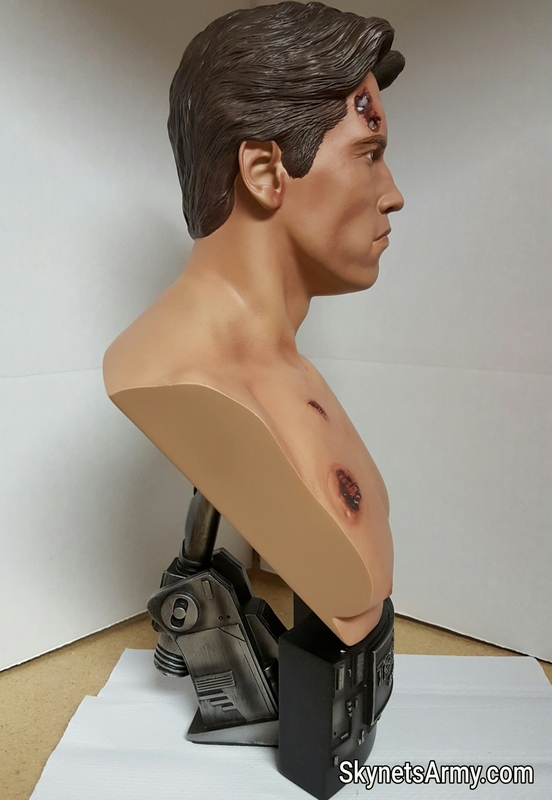 On the back of the bust there is a battery compartment that takes two AA batteries accompanied by an off/on switch (batteries not included). 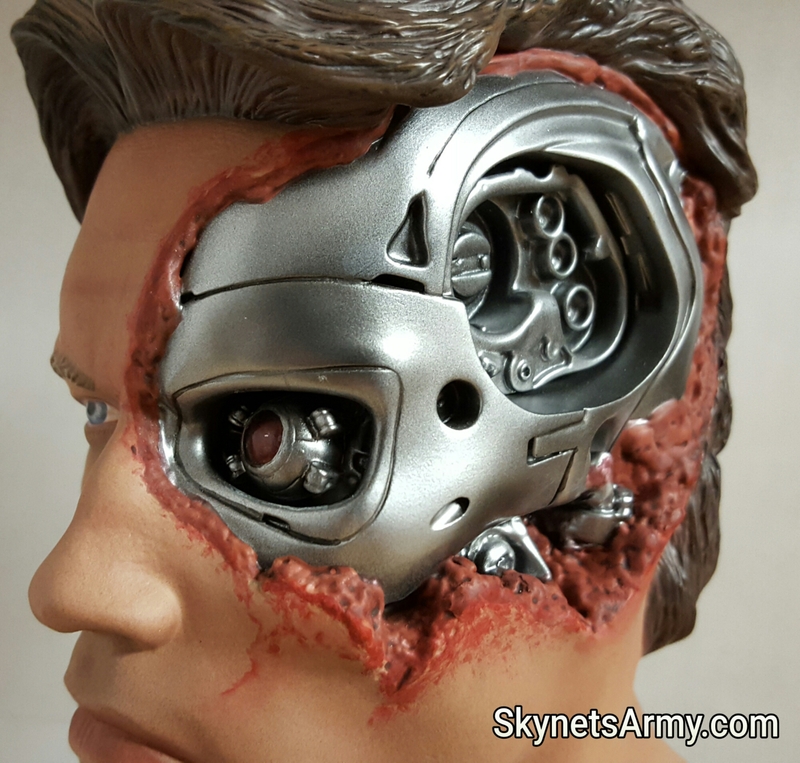 Shall we put in some batteries and turn this T-800 Model 101 on? 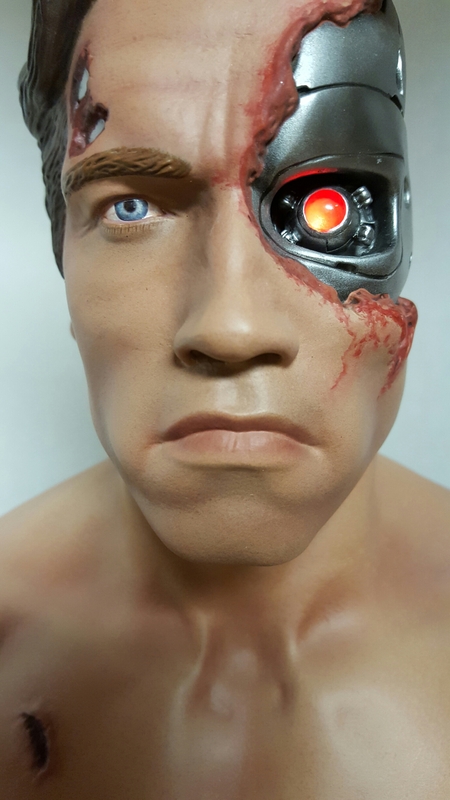 Look at the way the T-800’s eye lights up! Well that’s it! 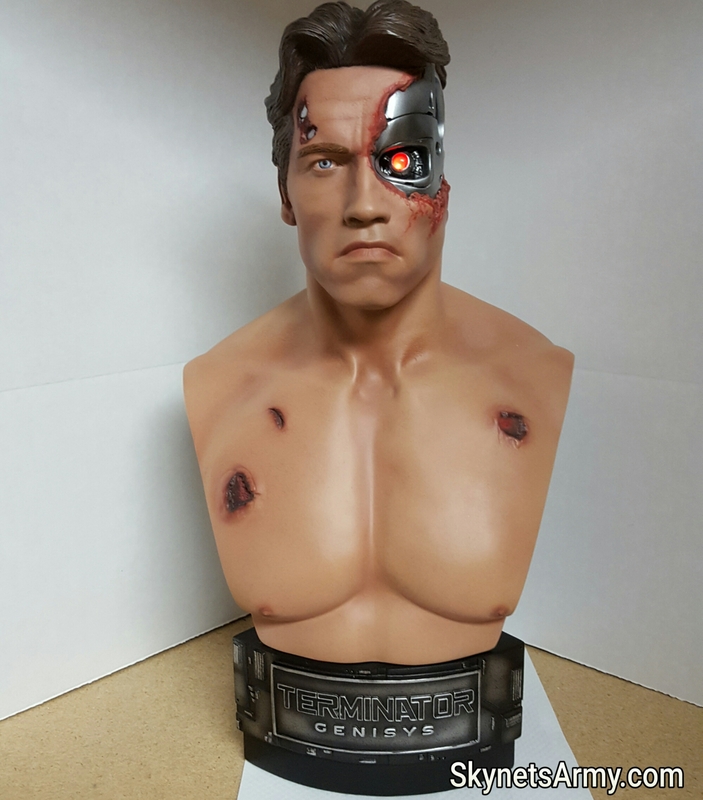 Chronicle Collectibles has done an amazing job with this “Terminator Genisys” bust. 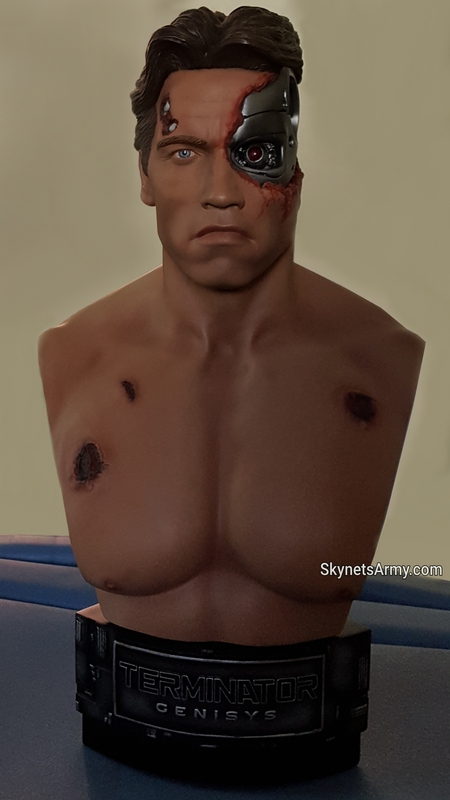 From the sculpt to the paint job, they have really captured the look of how a battle damaged Arnold Schwarzenegger Terminator would appear in the year 1984. 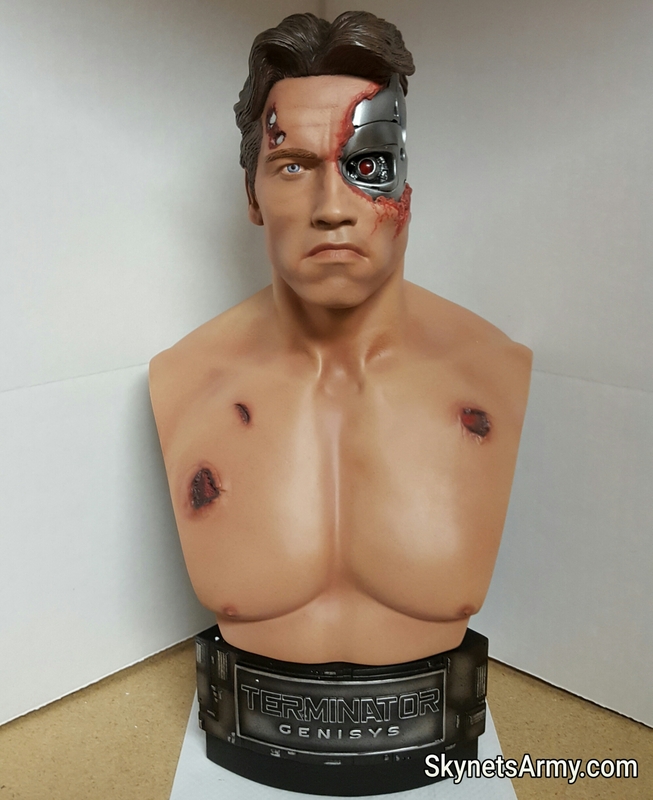 At press time there are only a few left of these fantastic busts. So if you would like to own one and haven’t ordered yours yet, you can buy one now HERE! 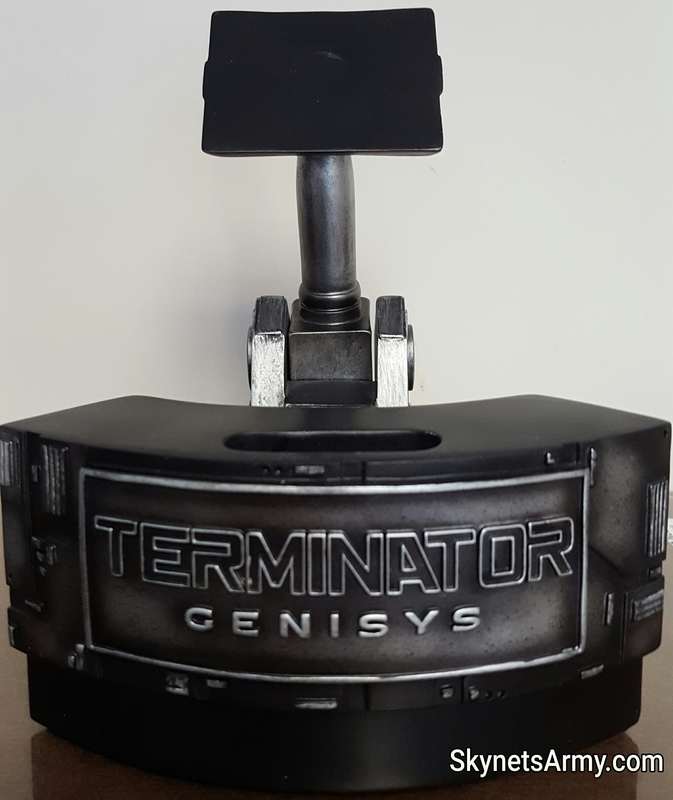 Previous PostTERMINATOR TRIVIA Volume 5: Cool Facts you may not know about the Terminator Franchise!Next PostTERMINATOR INTERVIEW: Actor Wayne Bastrup talks “GENISYS”, O’Brien and having beer with Clint Eastwood!